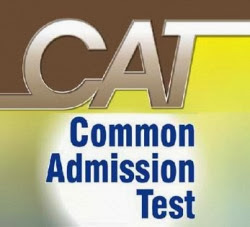 About CAT : The Common Admission Test (CAT) is a computer based test held in India. The Indian Institutes of Management (IIMs) started this exam and use the test for selecting students for their business administration programs. The test is conducted every year by one of the IIM's based on a policy of rotation. In August 2011, it was announced that Indian Institutes of Technology (IITs) and Indian Institute of Science (IISc) would also use the CAT scores, instead of the Joint Management Entrance Test (JMET), to select students for their management programmes from 2012-14 year. Candidates appearing for the final year of bachelor’s degree/equivalent qualification examination and those who have completed degree requirements and are awaiting results can also apply.IIMs may verify eligibility at various stages of the selection process, the details of which are provided at the website www.cat2013.iimidr.ac.in . Admission Process : IIM shortlists candidates for second stage of selection which may be independent of each other. The process may include Written Ability Test (WAT), Group Discussions (GD) and Personal Interviews (PI).Performance in CAT2013 examination is an important component in the admission process. IIMs may use previous academic performance of the candidates, relevant work experience and other similar inputs in short listing and ranking of candidates at various stages of the admission process. The processes, academic cut-offs and the weights allocated to the evaluation parameters may vary across IIMs. For more information you may refer the admissions policies of IIMs from their respective websites. Second Section : Verbal Ability & Logical Reasoning.